Seminar speaker Michael Mazourek, Assistant Professor, Plant Breeding and Genetics, explains elements of disease resistance, coloration, heat and more. If you missed yesterday’s special seminar featuring featuring Travis Park, Jeff Perry, Heather Davis, Shari Lighthall, and Juleah Tolosky, you can view it below or here. The brown marmorated stink bug (Halyomorpha halys) is eating crops and infesting homes in the Mid-Atlantic region. It has been confirmed on Long Island and in the Hudson Valley. Adult (top) and fifth-instar nymph (bottom). Click image for larger view. USDA photo by Stephen Ausmus. This invasive pest can infest grapes, peaches, apples, pears, cherries, raspberries, and other crops. 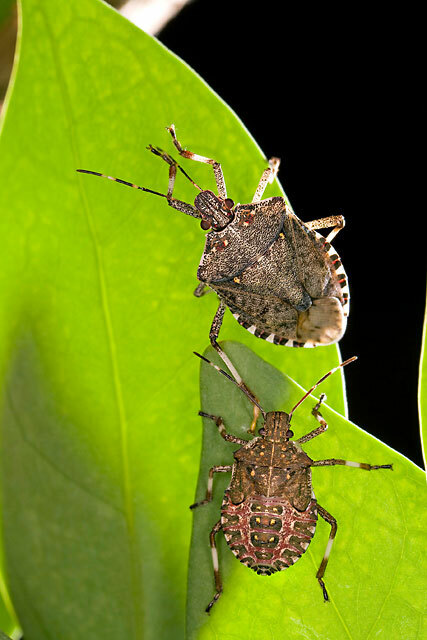 “A native of Asia, this particular stink bug was first spotted in Allentown, Pa., around 1996 and has hitchhiked into parts of New York, including the Hudson Valley, Long Island and New York City in the 15 years since, but it has not posed a serious statewide agricultural threat until now,” writes Amanda Garris in the Cornell Chronicle article New York wine industry faces stinky threat, professor warns. The Eastern New York Brown Marmorated Stink Bug Project is monitoring the spread of this pest. Visit their website for more information on how to submit samples for identification. The site also provides links to factsheets, webinars and more. 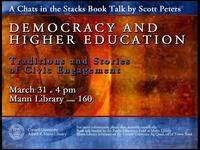 Largely from Chats in the Stacks event listing. Of all the issues in need of attention at this moment in the history of American higher education, few are as important as the status and future of its public mission, purposes and work. Scott Peters, associate professor of education at Cornell University’s College of Agriculture and Life Sciences, takes this issue up in his newest book, Democracy and Higher Education: Traditions and Stories of Civic Engagement, published last fall by Michigan State University Press. Through the presentation and analysis of oral history profiles of the public engagement work of a dozen Cornell faculty members, he illuminates and defends an underappreciated tradition of civic professionalism in higher education that includes and interweaves expert, social critic, responsive service, and proactive leadership roles. Peters’ research program is centered on the study of American higher education’s public mission and work, including the role of cooperative extension professionals in making democracy work as it should. He will be presenting a seminar on his book as part of Mann Library’s Chats in the Stacks series on Thursday, March 31 at 4:00 p.m. in Mann 160. A reception and book signing will follow. You can view or listen to Peter’s March 29, 2007 Chat in the Stack’s presentation, Engaging Campus and Community: The Practice of Public Scholarship in the State and Land-grant University at the Mann Library Podcast site. 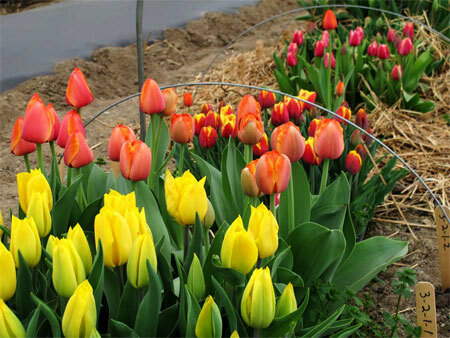 Tulips grown in high tunnels flowered three weeks earlier than those grown outside, potentially extending the season for New York growers. That’s just one of the findings you can read about in Chris Wien’s 2010 Cut Flower Cultural Practices Studies and Variety Trials. Wien also studied the effects of delayed transplanting, pinching larkspur, the effects of daylength on sunflowers and rudbeckia and more. 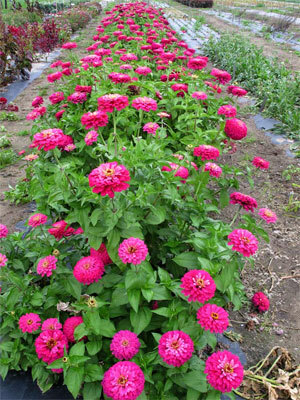 Trials also analyzed performance of varieties of amaranth, celosia, aster, Bells of Ireland, campanula, dianthus, gomphrena, ornamental kale/cabbage, lisianthus, marigold, scabiosa and snapdragon. Tulip varieties ‘Strong Gold’ (foreground), ‘Ad Rem’, ‘Double Focus’ and ‘Border Prince’ in the high tunnel. Seed sales benefit Synapsis, the Dept. of Plant Breeding and Genetics grad student organization. 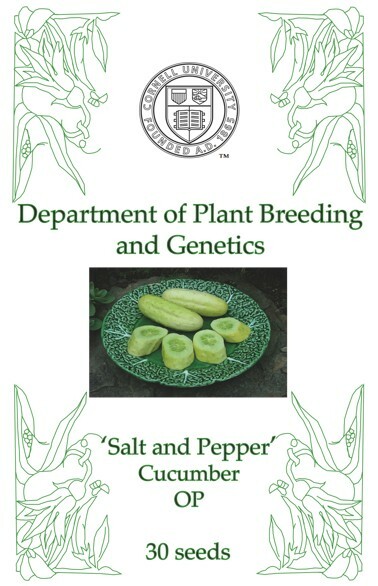 Synapsis, the graduate student organization of Cornell’s Department of Plant Breeding and Genetics, is selling seed packets of select vegetable cultivars developed by Cornell’s breeding programs. 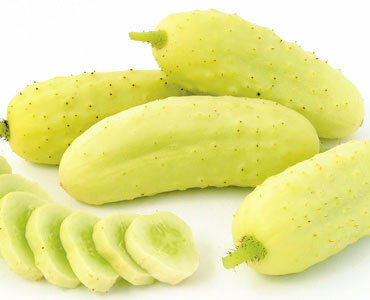 These cultivars are unique and delicious, they have resistance to common disease problems, and they produce high yields in upstate New York and beyond. Proceeds from sales of these special seeds benefit Synapsis. For how-to-grow information and more visit the Synapsis merchandise page. Cornell Orchards is open Tuesday through Saturday, 8:30 a.m. – 5:00 p.m. See website for latest info. Visit the Cornell Orchards website for directions, apple and cider specials and more information. Seeds will soon be available at Manndible Cafe and Cornell Plantations’ Brian C. Nevin Welcome Center. ‘Salt and Pepper’ photo courtesy Johnny’s Selected Seeds. 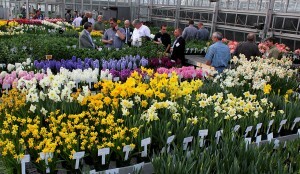 NAFWA members view Flower Bulb Research Program projects. The North American Flowerbulb Wholesalers Association held their annual conference (Theme: Green, are we realizing the opportunities?) at Cornell’s Statler Hotel March 18-19. 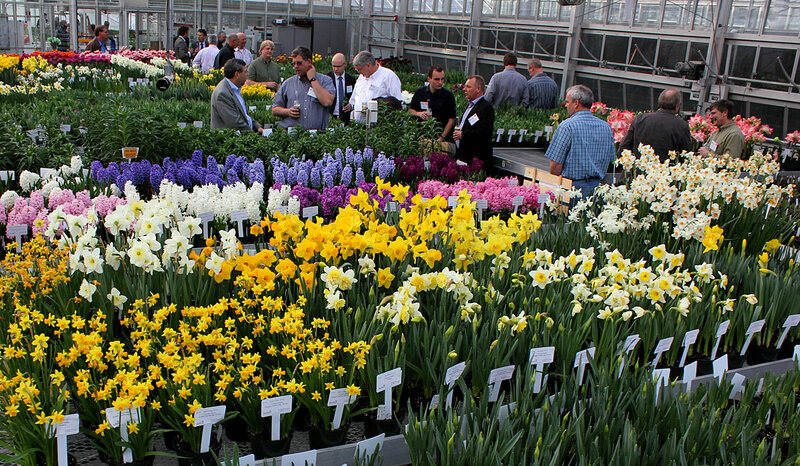 Part of the program included a tour of Kenneth Post Lab greenhouses to view projects and posters from the Department of Horticulture’s Flower Bulb Research Program. 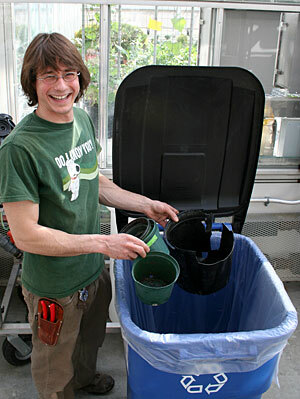 Greenhouse grower Jacob Wszolek recycles pots at the Plant Science Greenhouses. For more than two decades, Cornell’s greenhouse staff have recycled potting soil and plants to make compost for use on campus and off. But with the addition this year of a plastic recycling program, Cornell’s greenhouses just got even greener. Each year, experiments in Cornell greenhouses use tens of thousands of #5 polypropylene pots to grow plants. Whenever possible, the pots are sterilized and re-used. But it used to be that when they outlived their useful life, they were tossed out with the trash. Now, the greenhouse staff can simply tap out the soil and deposit unusable pots into collection bins located at six greenhouses around campus. The plastic will find new life as ice scrapers, rakes, brooms, bike racks and other products. At 155,000 square feet, Cornell’s greenhouses are the largest non-commercial facilities in New York. They house 200 to 300 research projects at any given time, growing everything from flower bulbs to bioenergy feedstock crops. They also support faculty teaching efforts. Most of the greenhouses are run by the Cornell University Agricultural Experiment Station, which is dedicated to sustainability in its two core functions – operation of world-class research facilities on campus and around New York and administration of federal formula grants. The recycling project is a joint effort led by the Safety, Health and Environmental Management Steering Committee for Cornell Greenhouses and the Cornell Recycling Department in Facilities Management. The entire greenhouse staff is enthusiastic about the recycling project as part of their commitment to reducing waste, energy use and carbon dioxide emissions. Glenn Evans ’03, MS ’07, PhD ’10, is the new director of agricultural operations at the Cornell University Agricultural Experiment Station (CUAES). Glen, formerly a research support specialist in the Weed Science program in the Department of Horticulture, oversees the agricultural operations of CUAES, including six farms throughout the state, CALS plant growth facilities and Dilmun Hill, Cornell’s student organic farm. Glenn received his PhD in Horticulture from Cornell, and has experience in vegetable and flower production systems, sustainable farming practices, and facility and equipment maintenance and repair. 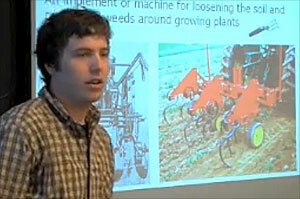 Cultivator tools – Evans demonstrates custom cultivator tools he developed at Cornell University’s Homer C. Thompson Research Farm in Freeville, N.Y. Applying vinegar with a banded, directed sprayer – Evans demonstrates a banded, directed sprayer he developed at Cornell University’s Homer C. Thompson Research Farm in Freeville, N.Y. The experiment tested coatings on the crop stems to minimize damage to the crop by the vinegar. Homer C. Thompson Research Farm profiled in Cornell Chronicle article by Mary Woodsen, Research is main crop at Thompson Research Farm. “A major focus of farm research is on sustainable systems approaches — ‘on how rotations, cover crops, fertility management, minimum tillage and similar environmentally friendly tactics increase yields while maintaining healthy soils for both conventional and organic growers,’ says McKay.